Daisy was the first inhabitant of this Doll place, she arrived in 1974. This one isn't the original one, as her hair got permanently ruined (Daisy's hair can't be combed at all!) and she's wearing the first dress my mum bought to her: Flapper. She's the most fashionable doll in the house, as she's designed and clothed by the one and only Mary Quant! Her wardrobe is quite nice, mostly of 1973 and 74 pieces, including trousers, dresses, blouses, coats, hats and all kinds of shoes, bags and accessories. Daisy has been a fashion inspiration to me and the envy of Strawberry. In the 80s I managed to get several packages of dolls and clothes at a toy store sell out. Those are mostly the items I have nowadays, although I still have some of the items bought in 1974-75, a bit worn out from playing. I dedicated one of my mini-sites to it's fabulous packaging and illustrations . A Daisy foi a primeira habitante deste lugar das Bonecas, ela chegou em 1974. Esta não é a original, pois o seu cabelo foi permanentemente estragado (o cabelo da Daisy não se pode pentear!) e ela veste o primeiro vestido que a minha mãe lhe comprou: Flapper. É a boneca mais na moda cá de casa, pois foi desenhada e vestida por Mary Quant ela própria! O seu guarda-roupa é bastante bom, na sua maioria constituído por peças de 1973 e 74, incluindo calças, vestidos, blusas, casacos, chapéus e todo o tipo de sapatos, malas e acessórios. A Daisy tem sido uma inspiração de moda para mim e a inveja da Strawberry. Nos anos 80 consegui arranjar vários pacotes de bonecas e roupas numa liquidação de uma loja de brinquedos. Esses são a maioria dos itens que tenho actualmente, apesar de ainda ter alguns dos comprados em 1974-75, mas um pouco usados de brincar com eles. Dediquei um dos meus mini-sites às suas fabulosas embalagens e ilustrações . A friend of mine ordered on https://www.thisisblythe.com and she is quite happy with her Blythe purchase. 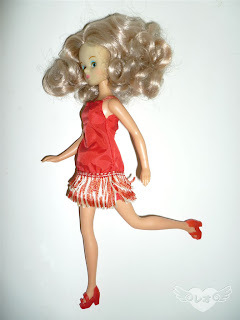 This post is about Mary Quant's Daisy, not Blythe dolls. In a blog where most posts are about Blythe,I wonder what made you choose this post to advertize a website where most information about the dolls sold isn't quite accurate.